We’ve all seen and used them… animated GIFs they are funny, distracting and seem to be everywhere. We have Alex Chung and Jace Cooke to thank for this incredible distraction and waste of everyone’s time. Seriously. It’s a distraction. The initial idea came to them over breakfast. There is now over 250 million users, and the company raised $55 million in funding at a $300 million valuation. Wouldn’t it be awesome if you could build your own Giphy Alternative in about the same amount of time it takes to eat your frosted flakes? Registered users should be able to upload animated GIFs (hosted GIFs included) via the platform. Registered and unregistered users should be able to view all the animated GIFs on a dashboard. Users should able to share those GIFs on Facebook and Twitter. Users will be able to convert videos to GIFs and download them. Shall we begin? We will build our app using React and set it up using the create-react-app tool. Just navigate to your dev folder and run the command below in your terminal. auth0-js - For authentication react-router - For routing within our app jwt-decode - For decoding the JSON Web Token in our app axios - For making network requests. Create components and utils folders under your src directory. In the utils folder, create a file AuthService.js and add this code to it. (See the ReactJS Authentication Tutorial by unicodeveloper to ensure you are on the right track). First let’s add Navigation and then create the different components that we need in our application. Now create a Nav.js in the components folder and the following piece of code to it. Uploading GIFs As mentioned earlier, we will be using Cloudinary to handle our images, including uploading and manipulating them. To start, let’s create an account on cloudinary.com. Uploading with Cloudinary is a breeze, using the simple Upload Widget. It enables you to upload files from various sources. So we are going to reference it in our application. Open your index.html file and add the following code to the bottom of your page. Now, create a file called WidgetHelper.js in the utils folder and add the following piece of code to it. The cloudname_ and uploadpreset_ options are the only mandatory properties required to make uploads work, but we have set a few more options. Most important to note now is the tags, which we will use to work some magic. Now, login to the application and then click on the upload button to upload a new GIF file. Note that I have added some restrictions to the type of file that can be uploaded using the clientallowed_formats_ option of the upload widget. You can create a new upload preset from your Cloudinary dashboard. Do make sure it is an unsigned one. You also can check out your uploads from your dashboard. We have added a callback to our uploadWidget helper, which takes in the result object, so we can work with it. We have uploaded GIFs, but they are nowhere to be found on our dashboard. There are several ways this can be achieved. But since we are using React, we are in luck. Cloudinary provides a simple React component that is capable of handling the display of all our files. All we need to supply it is the publicId of our file on the cloud. Now remember that tag property we mentioned earlier during upload, here’s where we perform some magic with it. 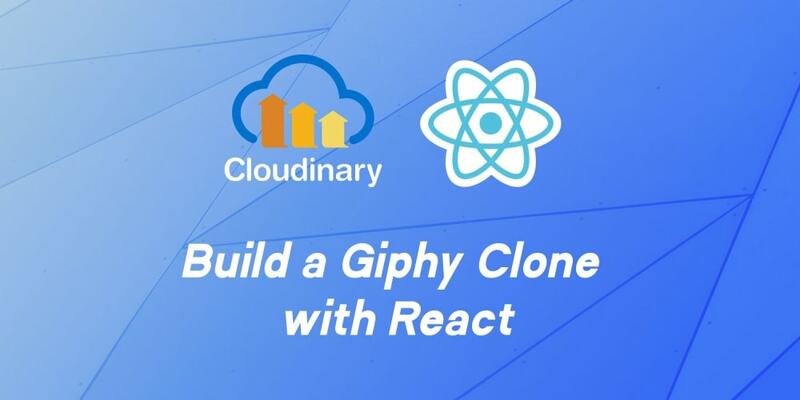 First off, let us install the Cloudinary React component. You should now see all the GIFs displayed in a very beautiful grid. Now we will implement sharing on social media. First we install react-share component. Now, copy and paste the following codes to the top of the components/Dashboard.js file. Now add the following piece of code within the div with class panel-footer. On reload, you should now have both share buttons for Facebook and Twitter. It has been nice so far creating our own lovely GIF platform. But it would be even more awesome to be able to create our own GIFs from video files that we can then save to our computers. Let’s go ahead and build a GIF maker into our application and see how Cloudinary takes away much of the effort that would have been required to build this. Go ahead and open the empty components/Create.js file we created earlier and add the following piece of code to it. There is just more magic going on here. Cloudinary is able to serve your videos as GIFs and all you have to do is append the extension .gif to the end of the resource url from Cloudinary. The so and eo parameters specify the start offset and end offset, meaning a specified start time to a stop time duration of the video will be converted to a GIF. Now you have a fully functional clone of your Giphy ready for a demo and your very own GIF maker to go with it. What more could you ask for? Cloudinary provides us with limitless possibilities with file management and a lot of other awesomeness if you’re working with media files. You should definitely go play with some more of the features that could be found in their documentation. The source code of the project is on GitHub. Let me know in the comments below if you have any questions or challenges. Technical Writer, Speaker, Community Builder, Dev Evangelist. Organiser of DotNet Nigeria, DigitalOcean Lagos and Python Nigeria. Developer at VConnect Nigeria.